WASHINGTON -- Former White House chief strategist Steve Bannon is stepping down as chairman of Breitbart News Network after a public break with President Donald Trump. Trump lashed out at Bannon for comments made in Michael Wolff's "Fire and Fury: Inside the Trump White House," which questions the president's fitness for office. 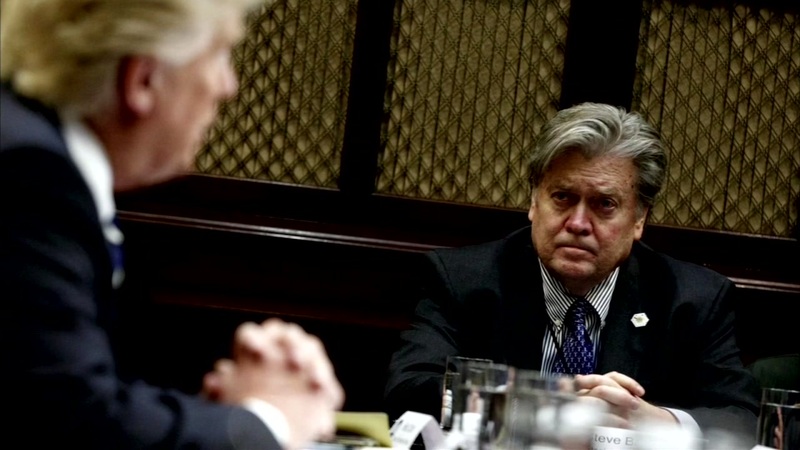 As Trump aides called him disloyal and disgraceful, the president branded his former chief strategist on Twitter as "Sloppy Steve," an apparent reference to Bannon's often unkempt appearance, and declared that "he lost his mind" when he was pushed out of the White House last August. The president was livid about Bannon's remarks - not just at the insults about his family, but also at his former strategist's apparent intent to take credit for Trump's election victory and political movement, according to a White House official and two outside advisers not authorized to speak publicly about internal conversations. After days of silence amid withering criticism from his former colleagues and his largest benefactor, Bannon tried to make amends. He issued a statement Sunday praising the president's eldest son, Donald Trump Jr., whom he was quoted accusing of treasonous behavior in the book. Bannon did not apologize for his criticism of the president's daughter and son-in-law, Ivanka Trump and Jared Kushner, with whom he had squabbled inside the West Wing. Inside the White House, Bannon was viewed as the keeper of Trump's nationalistic flame, charting the progress on the president's promises to his base on dry erase boards in his office. But Bannon was marginalized in the months before his ouster over Trump's concerns that the top aide was being viewed as an Oval Office puppeteer. The White House did not immediately respond to the news of Bannon's ouster, but press secretary Sarah Huckabee Sanders last week called on the conservative site - which has been a steadfast backer of the president - to "look at and consider" parting ways with Bannon. On Monday, deputy press secretary Hogan Gidley said Bannon's apology did not alter his standing with the president. "I don't believe there's any way back for Mr. Bannon at this point," Gidley said.